For the first fifteen years of the University of Oregon’s existence, the campus was without any student publications. 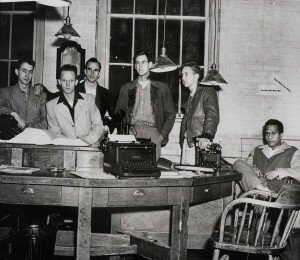 During this nascent phase of the university’s development, though, the framework that would eventually lead to the proliferation of student newsletters, newspapers, and magazines was erected. 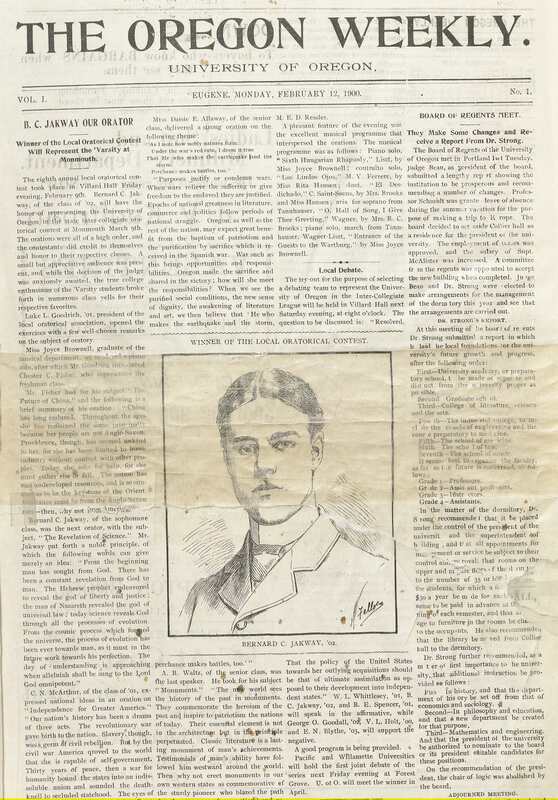 The early formation of literary societies was critical in catalyzing the rise of student publications, and the early publications set a precedent for independent journalism for more than a century. Today’s post illuminates the early efforts of students to bring news and commentary to print, focusing on the first publications created by the UO student body. Most of the reporting involved notes about each class and details about the day-to-day functions of the Laureans and Eutaxians. Each month The Reflector also discussed the various campus improvement projects that were either in the works or still needed. Student authors rallied for improved library facilities, praised the construction of a new gymnasium and decried its subsequent abuse by students, and questioned the relative absence of interest in athletic competition among the early student body. 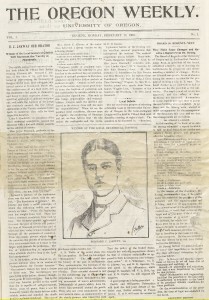 The monthly publication also focused at times on larger national discourses. The first issue discussed “The New South” and the divergent dynamics at play in a country only one generation removed from the Civil War. During its run, other writers would expound upon the increase in Japanese and other foreign students at American universities; the 1892 World’s Fair and Columbian Exposition in Chicago; and the conflicted opinions of Abraham Lincoln regarding slavery. Much of these articles had originally been developed as oratorical speeches, both within the literary societies and in competition for annual prizes. 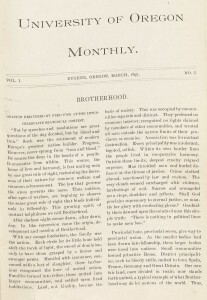 Working together, the two literary societies produced 28 issues of the first student publication between March 1891 and April 1894. A lack of funds would ultimately prove the publication’s demise, as sales failed to bring in enough revenue to continue funding the publication of the monthly newsletter. Though this first attempt at producing a student magazine proved short-lived, it served as the vanguard for a long history of student-produced publications at the University of Oregon. 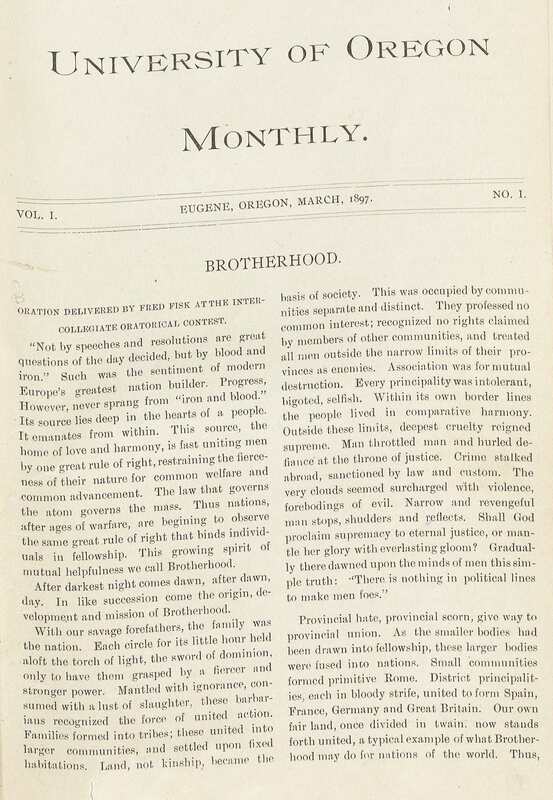 The Oregon Monthly, a collaborative effort involving the Laurean, Eutaxian, and Philologian Societies, first appeared as a 20-page newsletter for ten cents an issue in March 1897. Like The Reflector this publication focused largely on literary offerings and transcripts of orations, with news stories providing the remainder of the content. With the rise of Greek life on campus, though, interest in the literary societies waned. The literary societies in part could blame this on their own publications, as it was a guest editorial in the February 1892 edition of The Reflector that first broached the subject of introducing fraternities and sororities to the University of Oregon campus. In the end, just like its predecessor, the Oregon Monthly eventually folded due to financial difficulties. By that point, however, its position as the primary campus publication had already been overtaken by the Oregon Weekly, the direct predecessor to the Daily Emerald that began operation in 1900. The eight-page newspaper has expanded into the main independent student voice for campus news and editorials, remaining in operation in various formats for the past 115 years. Over the years other student periodicals have continued to spring up from the campus community. Annual yearbook publication began in 1902 with the first edition of the Webfoot; the volume would undergo several name changes over the years before settling on Oregana after 1910. Satirical and literary offerings such as Lemon Punch and Oregon Voice have blossomed, as have alternative news and editorial outlets such as the Oregon Commentator and Student Insurgent. In every instance, student publications have provided a venue for the UO student body to articulate its diverse opinions on important events both on campus and within the local, national, and global community. 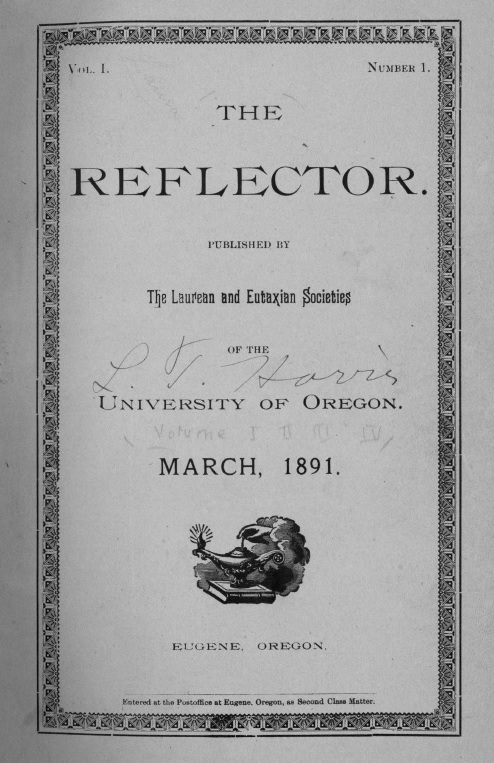 Laurean and Eutaxian Societies’ records, 1878-1909, UA 125, Special Collections & University Archives, University of Oregon Libraries, Eugene, Oregon. The Reflector, 1891, Scholars’ Bank digital archives, University of Oregon Libraries, Eugene, Oregon. “Student Publications,” University Archives alphabetical subject files, UA Ref 1, box 14, Special Collections & University Archives, University of Oregon Libraries, Eugene, Oregon. University of Oregon Monthly, 1897, Oregon Collection, 378.795 OQu, Special Collections & University Archives, University of Oregon Libraries, Eugene, Oregon. University of Oregon Weekly, 1900, Oregon Collection, 378.795 OQor, Special Collections & University Archives, University of Oregon Libraries, Eugene, Oregon. Images sourced from the University Archives Photographs (UA Ref3) and Oregon Collection resources.